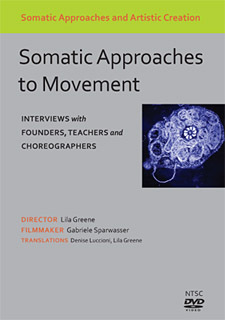 A collection of educational and artistic DVDs on somatic approaches in dance and movement training. The first DVD includes an overview of somatic education and interviews with founders, teachers and artists of six different techniques. The second DVD presents applications of movement analysis in ballet training. 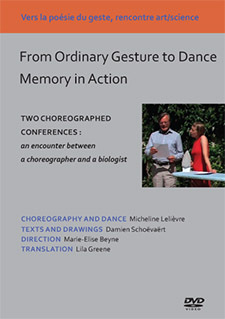 The third DVD presents a choreographer and a biologist working together in choreographed conferences, illustrating how art and science can meet in the poetry of gesture. 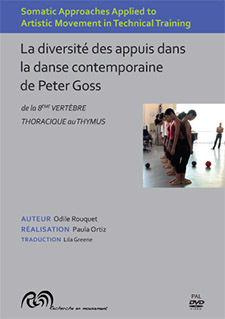 The fourth DVD addresses the diversity of supports in the teaching of Peter Goss, with bonuses on the thymus and on the 8th thoracic vertebra. The fifth DVD presents interviews with performing artists deeply experienced in an ancestral approach to movement (a martial art or yoga) and how the practice influences their creative expression. Please download the order form (.pdf), print and mail with your check	to:	eeg-cowles Foundation, Cowles Office, Suite 1620, 111 West Washington Street, Chicago, IL 60602.
institution that is buying the dvd, for free, and exclusively under these conditions. We trust you will appreciate the quality of our dvds. We are unable to process any refunds. All sales are final. We do not sell or give away any of the personal information you give us. We use the information only to complete the operation that you have chosen with us, such as a donation or purchasing one of our educational products. AFCMD with Odile Rouquet and Olivier Lefrançois, Nathalie Schulmann and Alban Richard. 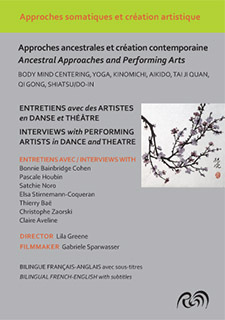 This bilingual DVD presents a series of interviews with performing artists who are deeply experienced in what we call “ancestral approaches” to movement. Some of these performers also teach their discipline. “Ancestral approaches” have their origins in Asia, (India, China and Japan), where they have been practiced and taught for centuries, as they are more recently in the West: Yoga, Kinomichi, Aikido, Tai Ji Quan, Qi Gong, Shiatsu/Do-in. Interviews with: Bonnie Bainbridge Cohen, Pascale Houbin, Satchie Noro, Elsa Stirnemann-Coqueran, Thierry Baë, Christophe Zaorski, Claire Aveline. 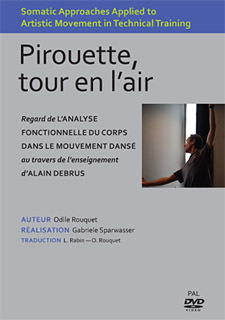 Somatic Approaches applied to artistic movement in technical training is explained through the teaching of Alain Debrus and the boys in their second year at the Conservatoire National Supérieur de Musique et de Danse de Paris learning pirouettes and turns in the air, with Odile Rouquet for AFCMD (Functional Analysis of the Body in Dance Movement). Bonus: additional information on eye movement by A. Semont, and on tensegrity theory by T. Myers. Booklet of 18 pages included. Booklet of 14 pages included. Breathing is the fundamental act of life. Everyone breathes but each his own way. 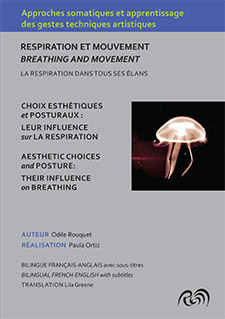 When breathing and gesture are coordinated, breath creates a unique expression. Guy Cornut, a voice specialist, brings us into the intimacy of this world with exceptional x-ray images of the diaphragm taken during singing sessions. Philippe Campignion, a physical therapist, explains anatomical movement with images in 3D. Artists, both dancers and musicians, explain how specific breathing effects their art and performance. Two short films reveal the collaboration between the choreographer Micheline Lelievre and the biologist Damien Schoëvaërt, who present two choreographed conferences, “From Ordinary Gesture to Dance”, and “Memory in Action”, illustrating how art and science can meet in the poetry of gesture.